Time-phased allocation data can be used to provide a budget forecast, revenue forecast and resource allocation requirements with various Rollup By and Row Selection options for total and sub-total data. You can access this report through My Reports icon under the Resources tab or within your project by clicking on Resource Allocation under the Resources drop down. If you access the report from within your project, the report will display and then you can use the page display options icon to customize your report. The initial display above includes the option to select date ranges for the report and to restrict the results to a maximum number of records. Selecting from the drop downs for Resource Departments, Resource Company, Resource Type/Role, Resource and/or Project Manager allows you to filter the report for specific results. If your administrator has created a customer User field and configured it to be a report filter, then it will show in your display options for filtering. The image below is only an example. In addition, there are two options to force the results to be associated with the project as defaults. Using the drop down selectors, you can further refine your report by Project Type and/or Project Managed By. 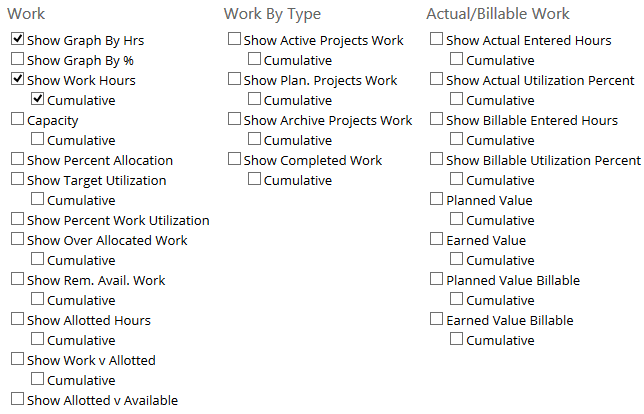 Using the check boxes will allow you to additionally turn on and off the three additional filters of Active Projects, Planning Projects or Archived Projects. Note only one of the three can be active at one time. Column Chart, Area Chart and Line Chart: Aggregate By is the x-axis and the Chart Columns is the y-axis. Expand tree arrow and collapse tree arrow down view options are available within the report results based on the roll up chosen. You can also expand and collapse the report results using the Tools drop-down in the upper right of the page. In addition, there are eight check boxes to further refine the results for your report. Many other options are available for customizing the results of your report under Row Selections. These are grouped into Work, Work By Type and Actual/Billable Work. Table Column Selections will control the data fields displayed as columns for the resulting output of the report. Detailed information for setting preferences in the data field column displays is contained in the Page Display Options topic. 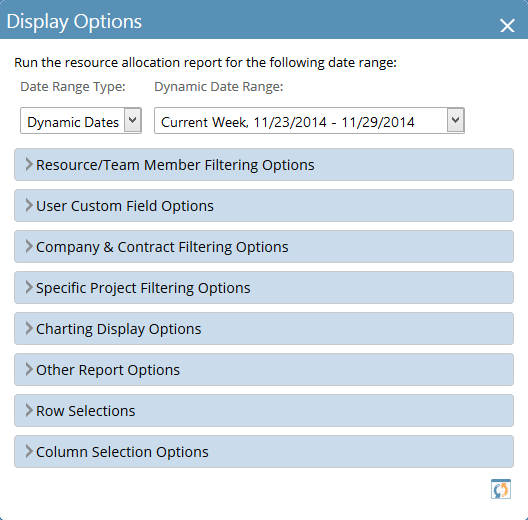 See article for Over Allocated Resources to drag and drop work items on the Resource Allocation report.